May 27, 28, 29, 30 & 31, 1986. Frances Moulton has been a member of Wick Theatre Company for 30 years and in that time has taken such varied parts as Aunt Penniman in The Heiress, Elizabeth Barret Browning in The Barretts of Wimpole Street, Maggie in Hobson’s Choice and Lil in Fings Ain’t What They Used To Be. She also directed many Wick plays, including Pride and Predjudice, Sailor Beware and the one-act Festival winner Streuth. She has also been in several County plays from the first one The Mad Woman of Chaillot to Oh What a Lovely War. Brian Moulton joined the Company in 1955 and made his first appearance in 1956 in Life with Father. Since then he has acted and directed for Wick and also for some time was Workshop Director for the construction of sets. Among his many rôles he has appeared as Eddie in View from the Bridge, Othello, the father in Spring and Port Wine, Hobson in Hobson’s Choice, King Henry Vlll in A Man for all Seasons and King Henry ll in The Lion in Winter. Margaret Faggetter attended the Brighton and Hove School of Music and Drama, where she studied all aspects of acting. She joined Wick Theatre Company in 1983 to play Gwan in Trespass. Since then she has appeared as Sheila in Noah, Mrs. Knepp in And So To Bed and the Cat in Pinocchio. Eddie Roberts first trod the boards for Wick in 1983 playing Saviello in Emlyn Williams’ Trespass. He has since played many parts with different Sussex Companies, among them being Lazar Wolf in Fiddler on the Roof with the Gemini Players, de Quadra in Vivat Vivat Regina in the Arundel Festival, Finneas Fogg in Sweeny Todd, to mention a few. Following this production he is to play Fagin in Oliver at the Gardner Centre in July. WICK Theatre Company promise one of the funniest plays to come to the Barn Theatre, Southwick, for years as they stage Somerset Maugham’s comedy The Noble Spaniard. Among the mysteries is why does an elderly Englishwoman talk of being thrown, in a sack, into the Bosphorus and why does a posy of flowers keep being thrown in and out of the window? Set in Boulogne in 1845, the play has allowed Pat Moss to design and make some beautiful costumes, including crinolines. The cast features some very experienced Wick members in Brian Moulton, Joan Bearman and Karen Mulholland, plus guest appearances from two of the Southwick Players. Margaret Faggetter claims her first leading part with the company, while Eddie Roberts plays the title rôle. Director Betty Dawes describes The Noble Spaniard as a ‘truly delightful play’ that audiences are urged not to miss. The play opens at the Barn on Tuesday and continues Saturday, inclusive. WHY does an elderly Englishwomen staying in Boulogne in 1845, talk of being thrown, in a sack, into the Bosphorus? And why keep a posy of flowers keep being thrown in and out of the window? The answers are in The Noble Spaniard, a comedy by Somerset Maugham, claimed to be one of the funniest plays to come to the Barn Theatre at Southwick Community Centre, where it opens on Tuesday. It’s a farce about a Spaniard’s efforts to find his beloved’s husband and his successive provocations of every man he meets to mortal combat. Pat Moss has designed and made beautiful costumes, including crinolines, and the cast includes Brian Moulton,, Joan Bearman and Karen Mulholland, with guest appearances from two Southwick Players – Margaret Faggetter and Eddie Roberts in leading rôles. PERIOD PIECES have always been one of Wick Theatre Company’s fortes – and their latest production did little to damage that reputation. 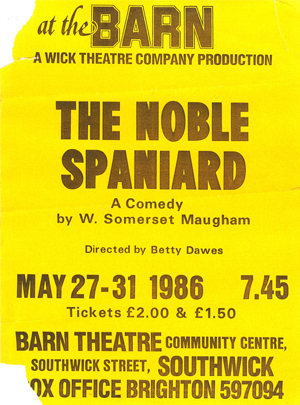 The Noble Spaniard, by Somerset Maugham, was billed as one of the funniest plays to come to the Barn Theatre, Southwick, for years. With Maugham’s brilliant handling of the plot to this French-based love tangle, set in 1845, Wick were assured of laughs as their experienced cast turned in a barn-storming performance under Betty Dawes’ direction. Such was the nature of the play and its flamboyant characters that it was an invitation for the participants to go well over the top. Eddie Roberts, although surprisingly less than word perfect on the third night, was in ebullient form in the title rôle, swaggering from confusion to confusion in his quest for the hand of young widow Marion Nairne, expertly played by Margaret Faggetter. Husband and wife pairing Brian and Frances Moulton hopefully don’t model their domestic life on the appallingly hilarious couple they were chosen to play – Mr. Justice and Lady Proudfoot. Equally unrestrained performances came from Karen Mulholland [Lucy] and Barry Heselden [Captain Chalford].